Nice to meet you Martin Dougiamas | BaseTIS now! During all the time that BaseTIS has been part of my life, I keep having these moments of magic when I realize that I am privileged. Sometimes, on my way back home, I put my hands in the pocket and let the reality hit me: I am carrying the key to La Pedrera… And that is just a small example of what I am referring to, and to be honest, it is not a good example at all, as it is only a glimpse of the material value that it might represent. This time all the merit goes to our colleague Xavi Valls who played the matchmaker role. 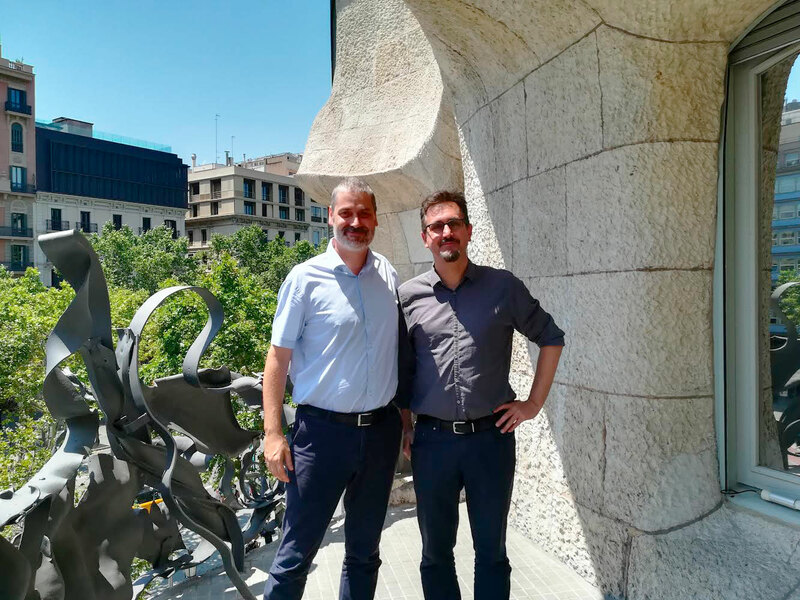 His perseverance and constant insistence during the recent Moodle conference in which he participated, convinced Martin Dougiamas to pay us a short visit in the Barcelona office. It is Xavi who picks Martin up at the corner of the street and who, in his pre-Internet era English, welcomes him and walks him up to our floor where Martin strolls and enjoys taking videos of the truly stunning architectural Gaudi realm that surrounds all of us. At the “Column” meeting room, Marc Castells awaits him and I sneak inside, after having been bragging for a little while with my other workmates that we are actually about to meet Mr Moodle. Marc is slightly nervous, it’s been long time since he last practiced his English and, as one can expect, our company presentation in this language is not up to date. But all happens naturally, we explain Martin who we are (or more often, who we aim to be, which itself is a crucial step in the entire process of achieving our next milestones). Martin is far ahead of us in so many areas: his leadership in the Open Source community, its clear and concise mission of “Empowering educators to improve our world” and, last but not least, his valuable experience – we feel enlightened by his presence. When he talks about the Sustainable Development Goals defined in 2015 by the United Nations, he is convinced that this is the way to go and that these should be the basic guidelines for any human activity. He explains the reasons behind his decision about accepting the investment offer from the Leclercq family (the owner of Decathlon, among others) and how he connected with them through their shared values and similar vision..
Back to us, Martin is clearly amazed by our internal policies such as Social Experiences or the donations. We are surprised to see him take a picture of the slide on Tinbergen Rule, we find ourselves quoting together Reinventing Organizations and discussing common values. This unique atmosphere that is created when people from opposite sides of the globe come to realize that they share the very essential beliefs and that even for this mere reason, we shouldn’t yet give up on the world... is overwhelming. This is a social adrenaline rush that we need, the boost that will help us pursue our own path. Most probably, this encounter will not bring any financial profit for any of the participating parties, but, at least on our side, Martin’s visit proves to be far more motivating and fulfilling that any business profitable reunions that we hold on regular basis. Shall we write a mission statement? Will we succeed in defining it so simple, concise and perfect as he did? Crònica personal de la visita de Martin Dougiamas, fundador y CEO de Moodle, a nuestras oficinas de La Pedrera. Esta vez hay que agradecer el papel de Celestina que ha hecho nuestro compañero Xavi Valls. Su insistencia en las últimas jornadas de Moodle a las que asistió, consiguió convencer a Martin Dougiamas para que nos hiciera una visita a nuestras oficinas. Es él quién lo recoge en la esquina y quien con su inglés pre-Internet lo acompaña hasta nuestro piso, por donde Martin pasea tomando vídeos del espectáculo arquitectónico que nos rodea. En la sala Columna, les espera Marc Castells y yo me cuelo dentro tras alardear con varios compañeros de que tengo una reunión con el Señor Moodle. Marc está algo nervioso, mucho tiempo sin practicar su inglés y como es habitual, nuestra presentación en dicho idioma no está actualizada. Pero todo transcurre con naturalidad, le explicamos quiénes somos (a veces es más quienes queremos ser, como un paso más para serlo). Martin nos saca mucha ventaja en muchas cosas, su liderato en la comunidad Open Source, su misión clara y sintética “Empowering educators to improve our world” y su experiencia, nos iluminan. Nos enseña los Objetivos de Desarrollo Sostenible que en el 2.015 definió la ONU y tiene muy claro que esa debe ser la guía básica para cualquier actividad humana. Nos explica su entendimiento con la familia Leclercq (propietaria entre otros de Decathlon), a los que ha aceptado como inversores por su forma de ver el mundo. Por nuestra parte, notamos cómo le agrada nuestra política de Social Experiences o la de las donaciones, nos sorprendemos viéndole sacar su móvil para hacer una fotografía de la slide de la Norma Tinbergen, nos encontramos citando Reinventing Organizations y compartiendo valores. El clima que se crea cuando personas de orígenes tan distintos se dan cuenta de que comparten lo más relevante y de que por tanto el mundo no se puede dar aún por perdido, es espectacular, es un subidón de adrenalina social que nos anima a insistir en nuestro camino. Probablemente no saquemos beneficio económico alguno ninguna de las dos partes de este encuentro, pero al menos por nuestra parte es mucho más motivador que los encuentros empresarialmente provechosos que tenemos. ¿Debemos marcar una misión? ¿Sabremos definirla tan sencilla y redonda como la que ha conseguido él? Que bonic!! Deu ser molt enriquidor coneixer gent així, CEOs que comparteixen principis i valors positius!! Espero que la relació vagi creixent amb el temps. Guat japen güiz mai inglish? is not bitifú?